Store was OK, price was cheap however 2 days later the slippers I purchased fell to pieces, I wont be bothering to go back into store for a refund, not worth my time. 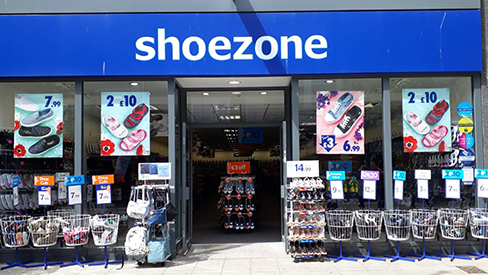 I wont be shopping at shoezone again - you pay for what you get. We came on for a pair of Wellington boots and left with a pair. Good checkout service, however could have been more enthusiastic. Overall a very good experience. I love your shops and the stocks all ways fantastic the staff work hard and manage to all ways pull the stops out to a great welcome. store is small with not much space between racks of shoes makes browsing and choosing shoes difficult.